For A Better Bobsled, Team USA Turns To Race Cars It's been 78 years since the U.S. brought home Olympic gold in the two-man bobsled event. After the last Winter Games, the Americans took a look at their aging sled — and decided to ditch it for a new BMW-designed one. Will it help them win gold? U.S. bobsledders Nick Cunningham and Abraham Morlu compete in a BMW-designed sled at the World Cup in January in St. Moritz, Switzerland. 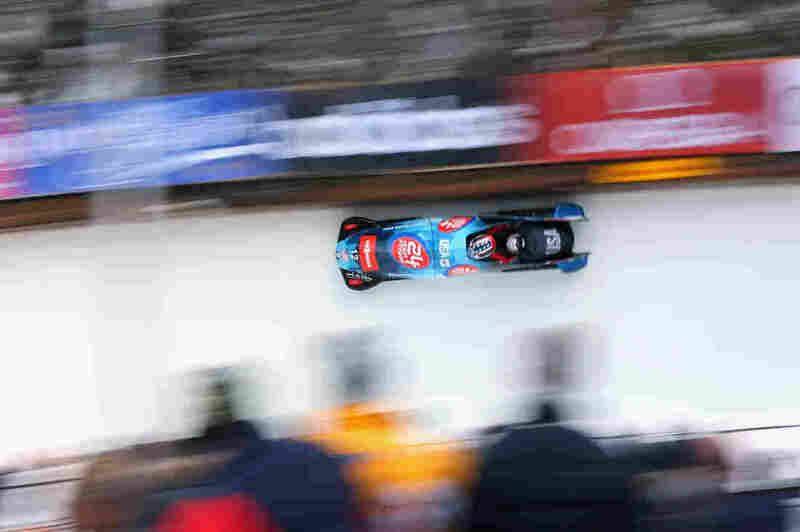 The U.S. team paired up with a BMW race car designer several years ago to boost its chances at the 2014 Winter Games. When you meet bobsled driver Steve Holcomb, he doesn't talk about his Olympic gold medal — the one he won with the four-man team at the Vancouver Olympics in 2010. Instead, he talks about the one that got away. Four years ago, his two-man bobsled started the Olympic run with a great push. "I was actually winning the race in Vancouver," Holcomb says. But then he "made a driving mistake, and we went from first place to sixth place in two turns." Holcomb blames himself. In bobsledding, any slight mistake in the driving can cost you the fraction of a second you need to win. But the problem was bigger than any one run: The U.S. team hadn't won a gold medal in the two-man bobsled event since Franklin Roosevelt was president. So after the last Olympics, the team took a look at its sled. It was older than some of the athletes at the games. "The sled I had been using up until that point was actually about 19 years old," Holcomb says. "Rebuilt it every year and modified it to meet the rules. It was just one of those sleds that was fast." But the European teams had new sleds that were redesigned constantly — and built by race car designers. The Italians had the help of Ferrari, McLaren supported the U.K. bobsledders, and a Japanese Formula One team was working with that country's athletes. So the U.S. went looking for an American race car partner. But it wasn't Ford or Chevy — it was Michael Scully, creative director at BMW DesignWorks USA. Yes, BMW is a German company, but, as Scully stresses, it's BMW's North American division. Scully knew race cars. And, as it turns out, he knew the challenges of winter sports, too; he was a snowboard racer in his youth. So when he sat down in his first bobsled, Scully thought he knew what speed was. "It was very quickly clear to me that I was not in any way prepared," Scully says. "It's this very almost chaotic experience." Riding a bobsled into a corner is like having your head slammed into a wall by a really big guy. As soon as Scully hopped out, he was filled with ideas to make the sled more like a race car. But then there were all those rules. In order to make bobsledding fair, the teams must meet standards: The sleds must all be the same weight, and the runners on the bottom all carved from the same metal. 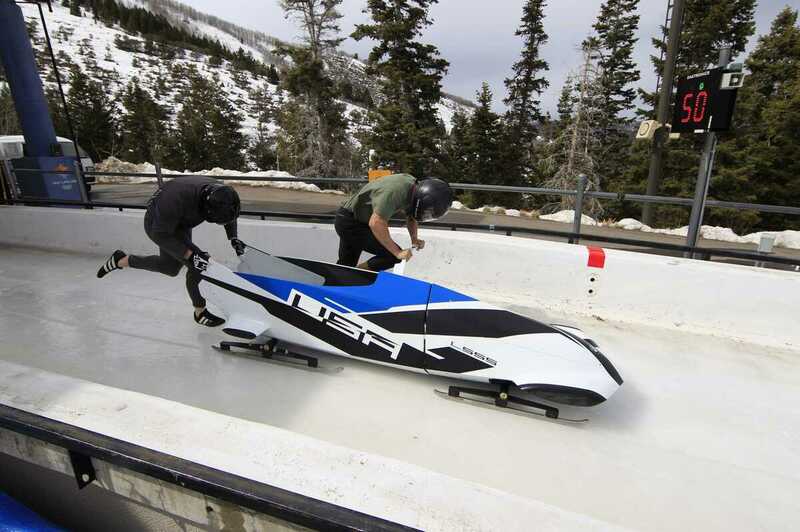 American bobsledders Justin Olsen and John Napier test BMW's two-man bobsled prototype in the Utah Olympic Park in 2012. But there's some wiggle room in the rules. The BMW designers moved the center of gravity, adapted the steering for Holcomb's style and made the sled smaller and more aerodynamic. That came as a bit of a surprise to the bobsled team's members, who are the size of football players. "It's quite snug," Holcomb says. "It is challenging to get in. Trust me — when you're at a full sprint and you have to jump over a 3-foot wall, basically, of the sled and you have to get in, it's not easy." But as the team tested the new sled, the numbers looked good: It was faster. The two-man team hopes this new design will give it an edge in Sochi. Now, it's not clear whether it really gives an advantage to Team USA. After all, the designers from Ferrari know the same principles of aerodynamics as the folks at BMW. But there is a psychological factor at play. When Team USA shows up with its brand-new sled, it stays covered, hidden from view. "You want people to think that they've thought of something that you haven't — [like] 'Why didn't I think of that?' " Scully says. And adding to the mystery, the new sled has put up very fast times so far this season. Holcomb's two-man team is now No. 1 in the world. Is it the new technology? A more confident driver? Better training? Part of the Olympic edge is to keep your opponents guessing.